Fruity Menu Pâté with turkey and apricot – A pâté made from fine turkey and ripe apricot pieces. The taste combination of a regal feast. So that your little darling knows that they are something really special to you. 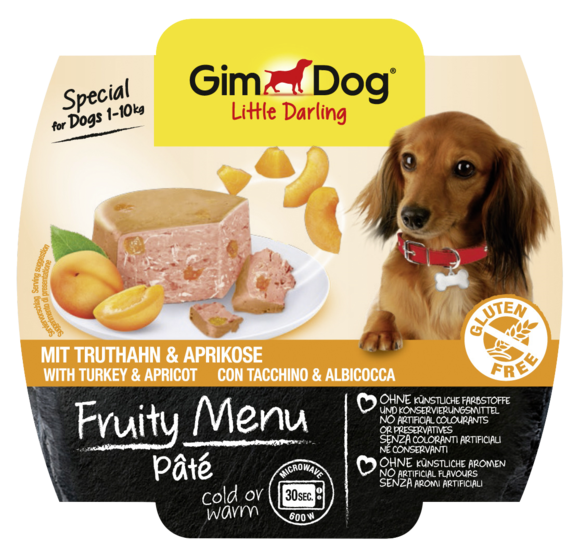 The Fruity Menus from GimDog Little Darling combine everything that owners want for dogs up to 10 kilograms: select ingredients, wonderfully delicious and versatile use to serve your little darling a very special menu in no time at all. The new little Fruity Menus are ready to eat either at room temperature, or they can be lovingly warmed up really quickly by simply removing the packaging’s lid and placing the menu tray in the microwave for 30 seconds. Whether as a pâté or ragout in sauce – the special mixture of meat, poultry and fish with the finest fruit and vegetables will make your little four-legged friend’s mouth water. All the Little Darling Fruity Menus are produced as carefully as possible to preserve the nutrients. The snacks do not contain any artificial colouring or flavouring and absolutely no genetically modified ingredients at all.